These highlights do not include all the information needed to use ELITEK safely and effectively. See full prescribing information for ELITEK. Hypersensitivity Reactions: Elitek can cause serious and fatal hypersensitivity reactions including anaphylaxis. Immediately and permanently discontinue Elitek if a serious hypersensitivity reaction occurs (4, 5.1, 6.2). Hemolysis: Do not administer Elitek to patients with glucose-6-phosphate dehydrogenase (G6PD) deficiency. Immediately and permanently discontinue Elitek if hemolysis occurs. Screen patients at higher risk for G6PD deficiency (e.g., patients of African or Mediterranean ancestry) prior to starting Elitek therapy (4, 5.2). Methemoglobinemia: Elitek can result in methemoglobinemia in some patients. Immediately and permanently discontinue Elitek if methemoglobinemia occurs (4, 5.3). Interference with uric acid measurements: Elitek enzymatically degrades uric acid in blood samples left at room temperature. Collect blood samples in pre-chilled tubes containing heparin and immediately immerse and maintain sample in an ice water bath. Assay plasma samples within 4 hours of collection (5.4). Elitek is a recombinant urate-oxidase indicated for initial management of plasma uric acid levels in pediatric and adult patients with leukemia, lymphoma, and solid tumor malignancies who are receiving anti-cancer therapy expected to result in tumor lysis and subsequent elevation of plasma uric acid (1). Limitation of use: Elitek is indicated only for a single course of treatment (1). Administer at 0.2 mg/kg as an intravenous infusion over 30 minutes daily for up to 5 days (2.1). Do not administer as an intravenous bolus (2.3). History of the following reactions to rasburicase: anaphylaxis, severe hypersensitivity, hemolysis, methemoglobinemia (4). Glucose-6-phosphate dehydrogenase (G6PD) deficiency (4). Most common adverse reactions (incidence ≥20%), occurring in patients with hematological or solid tumor malignancy and treated with anti-cancer therapy are vomiting, nausea, fever , peripheral edema, anxiety, headache, abdominal pain, constipation, diarrhea, hypophosphatemia, pharyngolaryngeal pain, and increased alanine aminotransferase. (6.1). To report SUSPECTED ADVERSE REACTIONS, contact sanofi-aventis U.S. LLC at 1-800-633-1610 or FDA at 1-800-FDA-1088 or www.fda.gov/medwatch. Pregnancy: May cause fetal harm. Use only if the potential benefit to the mother justifies the potential risk to the fetus (8.1). Nursing Mothers: Discontinue nursing or Elitek taking into account the importance of the drug to the mother (8.3). Elitek® can cause serious and fatal hypersensitivity reactions including anaphylaxis. Immediately and permanently discontinue Elitek in patients who experience a serious hypersensitivity reaction [see Contraindications (4), Warnings and Precautions (5.1), Adverse Reactions (6.2)]. Do not administer Elitek to patients with glucose-6-phosphate dehydrogenase (G6PD) deficiency. Immediately and permanently discontinue Elitek in patients developing hemolysis. Screen patients at higher risk for G6PD deficiency (e.g., patients of African or Mediterranean ancestry) prior to starting Elitek [see Contraindications (4), Warnings and Precautions (5.2)]. Elitek can result in methemoglobinemia in some patients. Immediately and permanently discontinue Elitek in patients developing methemoglobinemia [see Contraindications (4), Warnings and Precautions (5.3)]. Elitek enzymatically degrades uric acid in blood samples left at room temperature. Collect blood samples in pre-chilled tubes containing heparin and immediately immerse and maintain sample in an ice water bath. Assay plasma samples within 4 hours of collection [see Warnings and Precautions (5.4)]. Elitek® is indicated for the initial management of plasma uric acid levels in pediatric and adult patients with leukemia, lymphoma, and solid tumor malignancies who are receiving anti-cancer therapy expected to result in tumor lysis and subsequent elevation of plasma uric acid. Limitation of use: Elitek is indicated only for a single course of treatment [see Warnings and Precautions (5.1)]. The recommended dose of Elitek is 0.2 mg/kg as a 30 minute intravenous infusion daily for up to 5 days. Dosing beyond 5 days or administration of more than one course is not recommended. Elitek must be reconstituted with the diluent provided in the carton. Reconstitute the 1.5 mg vial of Elitek with 1 mL of diluent. Reconstitute the 7.5 mg vial of Elitek with 5 mL of diluent. Mix by swirling gently. Do not shake or vortex. Parenteral drug products should be inspected visually for particulate matter and discoloration prior to administration, whenever solution and container permit. Discard solution if particulate matter is visible or product is discolored. Inject the calculated dose of reconstituted Elitek solution into an infusion bag containing the appropriate volume of 0.9% sterile sodium chloride, to achieve a final total volume of 50 mL. Infuse over 30 minutes through a separate line or flush line with at least 15 mL of normal saline prior to and after Elitek infusion. Do not use filters during infusion of reconstituted Elitek drug product. Store reconstituted or diluted solution at 2–8°C. Discard unused product solution 24 hours following reconstitution. Elitek is contraindicated in patients with a history of anaphylaxis or severe hypersensitivity to rasburicase or in patients with development of hemolytic reactions or methemoglobinemia with rasburicase [see Boxed Warning, Warnings and Precautions (5)]. Elitek is contraindicated in individuals deficient in glucose-6-phosphate dehydrogenase (G6PD) [see Boxed Warning, Warnings and Precautions (5.2)]. Elitek can cause serious and fatal hypersensitivity reactions including anaphylaxis. In clinical studies, anaphylaxis was reported in <1% patients receiving Elitek. This can occur at any time during treatment including the first dose. Signs and symptoms of these reactions include bronchospasm, chest pain and tightness, dyspnea, hypoxia, hypotension, shock, and urticaria. Immediately and permanently discontinue Elitek administration in any patient developing clinical evidence of a serious hypersensitivity reaction [see Boxed Warning, Contraindications (4), Adverse Reactions (6.2)]. The safety and efficacy of Elitek have been established only for a single course of treatment once daily for 5 days. Elitek is contraindicated in patients with G6PD deficiency because hydrogen peroxide is one of the major by-products of the conversion of uric acid to allantoin. In clinical studies, hemolysis occurs in <1% patients receiving Elitek; severe hemolytic reactions occurred within 2–4 days of the start of Elitek. Immediately and permanently discontinue Elitek administration in any patient developing hemolysis. Institute appropriate patient monitoring and support measures (e.g., transfusion support). Screen patients at higher risk for G6PD deficiency (e.g., patients of African or Mediterranean ancestry) prior to starting Elitek [see Boxed Warning, Contraindications (4)]. In clinical studies, methemoglobinemia occurred in <1% patients receiving Elitek. These included cases of serious hypoxemia requiring intervention with medical support measures. It is not known whether patients with deficiency of cytochrome b5 reductase (formerly known as methemoglobin reductase) or of other enzymes with antioxidant activity are at increased risk for methemoglobinemia or hemolytic anemia. Immediately and permanently discontinue Elitek administration in any patient identified as having developed methemoglobinemia. Institute appropriate monitoring and support measures (e.g., transfusion support, methylene-blue administration) [see Boxed Warning, Contraindications (4)]. At room temperature, Elitek causes enzymatic degradation of the uric acid in blood/plasma/serum samples potentially resulting in spuriously low plasma uric acid assay readings. Special sample handling procedure must be followed to avoid ex vivo uric acid degradation [see Boxed Warning, Drug Interactions (7)]. The data below reflect exposure to Elitek in 265 pediatric and 82 adult patients enrolled in one active-controlled trial (Study 1), two uncontrolled trials (Studies 2 and 3), and an uncontrolled safety trial (n=82). Additional data were obtained from an expanded access program of 356 patients, for whom data collection was limited to serious adverse reactions. Among these 703 patients 63% were male, the median age was 10 years (range 10 days to 88 years), 73% were Caucasian, 9% African, 4% Asian, and 14% other/unknown. Among the 347 patients for whom all adverse reactions regardless of severity were assessed, the most frequently observed adverse reactions (incidence ≥10%) were vomiting (50%), fever (46%), nausea (27%), headache (26%), abdominal pain (20%), constipation (20%), diarrhea (20%), mucositis (15%), and rash (13%). In Study 1, an active control study, the following adverse reactions occurred more frequently in Elitek-treated subjects than allopurinol-treated subjects: vomiting, fever, nausea, diarrhea, and headache. Although the incidence of rash was similar in the two arms, severe rash was reported only in one Elitek-treated patient. Further studies, including one-active controlled study (Study 4) and four supportive studies, have been conducted in adult patients. In these studies, Elitek was administered to a total of 434 adult patients (58% male, 42% female; median age 56 years [range 18 years to 89 years]; 52% Caucasian, 7% African, 14% Asian, 28% other/unknown). Of these 434 patients, 275 adult patients with leukemia, lymphoma, or solid tumor malignancies at risk for hyperuricemia and tumor lysis syndrome (TLS) were randomized in an open label trial receiving either Elitek alone, Elitek in combination with allopurinol, or allopurinol alone (Study 4). A drug-related adverse reaction in Study 4 of any grade was experienced in 4.3% of Elitek-treated patients, 5.4% of Elitek/allopurinol-treated patients, and 1.1% of allopurinol-treated patients. Table 1 presents the per-patient incidence of adverse reactions by study arm in Study 4. Overall incidence ≥10% in any Elitek arm and the difference between any Elitek arm versus the allopurinol arm ≥5%. Events were reported and graded according to NCI-CTC version 3.0 and presented as preferred terms MedDRA version 10.1. Hypersensitivity reactions occurred in 4.3% of Elitek-treated patients and 1.1% of Elitek/allopurinol-treated patients in Study 4. Clinical manifestations of hypersensitivity included arthralgia, injection site irritation, peripheral edema, and rash. The following serious adverse reactions occurred at a difference in incidence of ≥2% in patients receiving Elitek compared to patients receiving allopurinol in randomized studies (Study 1 and Study 4): pulmonary hemorrhage, respiratory failure, supraventricular arrhythmias, ischemic coronary artery disorders, and abdominal and gastrointestinal infections. The incidence of anaphylaxis, hemolysis, and methemoglobinemia was less than 1% of the 887 Elitek-treated patients entered on these clinical trials. As with all therapeutic proteins, there is potential for immunogenicity. Elitek can elicit anti-product antibodies that bind to rasburicase and in some instances inhibit the activity of rasburicase in vitro [see Boxed Warning, Warnings and Precautions (5.1)]. In clinical trials of pediatric patients with hematologic malignancies, 24/218 patients tested (11%) developed antibodies by day 28 following Elitek administration as assessed by qualitative ELISA. Using quasi-quantitative immunoassays in rasburicase naïve adult patients with hematological malignancies, 47/260 (18%) patients were positive for anti-rasburicase immunoglobulin G (IgG), 21/260 (8%) patients were positive for anti-rasburicase neutralizing IgG, and 16/260 (6%) patients were positive for anti-rasburicase immunoglobulin E (IgE) from day 14 to 24 months after 5 daily doses of Elitek. The incidence of antibody responses detected is highly dependent on the sensitivity and specificity of the assay, which have not been fully evaluated. Additionally, the observed incidence of antibody positivity in an assay may be influenced by several factors, including serum sampling, timing and methodology, concomitant medications, and underlying disease. For these reasons, comparison of the incidence of antibodies to Elitek with the incidence of antibodies to other products may be misleading. The following adverse reactions have been identified from clinical trials and/or postmarketing surveillance. Because they are reported from a population of unknown size, it is not always possible to reliably estimate their frequency or establish a causal relationship to drug exposure. Immune system disorders: Cases of anaphylaxis with potential fatal outcome have been reported. At room temperature, Elitek causes enzymatic degradation of the uric acid in blood/plasma/serum samples potentially resulting in spuriously low plasma uric acid assay readings. The following special sample handling procedure must be followed to avoid ex vivo uric acid degradation. Uric acid must be analyzed in plasma. Blood must be collected into pre-chilled tubes containing heparin anticoagulant. Immediately immerse plasma samples for uric acid measurement in an ice water bath. Plasma samples must be prepared by centrifugation in a pre-cooled centrifuge (4°C). Finally, the plasma must be maintained in an ice water bath and analyzed for uric acid within four hours of collection [see Boxed Warning]. Rasburicase does not metabolize allopurinol, cytarabine, methylprednisolone, methotrexate, 6-mercaptopurine, thioguanine, etoposide, daunorubicin, cyclophosphamide or vincristine in vitro. No metabolic-based drug interactions are therefore anticipated with these agents in patients. There are no studies of rasburicase in pregnant women. Reproductive toxicity studies in rabbits treated during organogenesis with approximately 10 to 100 times the recommended human dose of rasburicase resulted in teratogenicity, including decreased fetal body weights and heart and great vessel malformations at all dose levels. Multiple heart and great vessel malformations were also observed in offspring of pregnant rats treated with approximately 250 times the recommended human dose of rasburicase. Other adverse effects were observed in rasburicase-treated pregnant rabbits at all dose levels tested and included pre and postimplantation losses, abortions, and decreased uterine weights [see Nonclinical Toxicology (13.2)]. It is unknown whether rasburicase can cross the placental barrier in humans and result in fetal harm. Because of the observed teratogenic effects of rasburicase in animal reproductive studies, use rasburicase during pregnancy only if the potential benefit to the mother justifies the potential risk to the fetus. It is not known whether rasburicase is excreted in human milk. Because many drugs are excreted in human milk and because of the potential for serious adverse reactions in nursing infants from rasburicase, a decision should be made whether to discontinue nursing or to discontinue rasburicase, taking into account the importance of the drug to the mother. The safety and efficacy of Elitek was studied in 246 pediatric patients ranging in age from 1 month to 17 years. There were insufficient numbers of patients between 0 and 6 months (n=7) to determine whether they respond differently from older children. Mean uric acid AUC0–96 hr was higher in children <2 years of age (n=24; 150 ± s.e. 16 mg hr/dL) than those age 2 to 17 years (n=222; 108 ± s.e. 4 mg hr/dL). Children <2 years of age had a lower rate of achieving normal uric acid concentration by 48 hours (83% [95% CI: 62, 95]) than those 2 to 17 years (93% [95% CI: 89, 95]). Of the total number of adults treated with Elitek (n=434) in clinical studies, 30% were aged 65 and over while 8% were aged 75 and over. No overall differences in pharmacokinetics, safety, and effectiveness were observed between the elderly and younger patients. The maximum reported overdosage of Elitek is a single dose of 1.3 mg/kg. No adverse events occurred in reported cases of overdosage. Monitor patients who receive an overdose and initiate supportive measures if required. Elitek (rasburicase) is a recombinant urate-oxidase produced by a genetically modified Saccharomyces cerevisiae strain. The cDNA coding for rasburicase was cloned from a strain of Aspergillus flavus. Rasburicase is a tetrameric protein with identical subunits. Each subunit is made up of a single 301 amino acid polypeptide chain with a molecular mass of about 34 kDa. The drug product is a sterile, white to off-white, lyophilized powder intended for intravenous administration following reconstitution with a diluent. Elitek is supplied in 3 mL and 10 mL colorless, glass vials containing rasburicase at a concentration of 1.5 mg/mL after reconstitution. Elitek 1.5 mg presentation contains 1.5 mg rasburicase, 10.6 mg mannitol, 15.9 mg L-alanine, between 12.6 and 14.3 mg of dibasic sodium phosphate (lyophilized powder), and a diluent (1 mL Water for Injection, USP, and 1 mg Poloxamer 188). Elitek 7.5 mg presentation contains 7.5 mg of rasburicase, 53 mg mannitol, 79.5 mg L-alanine, and between 63 and 71.5 mg dibasic sodium phosphate (lyophilized powder) and a diluent (5 mL Water for Injection, USP, and 5 mg Poloxamer 188). In humans, uric acid is the final step in the catabolic pathway of purines. Rasburicase catalyzes enzymatic oxidation of poorly soluble uric acid into an inactive and more soluble metabolite (allantoin). The measurement of plasma uric acid was used to evaluate the effectiveness of rasburicase in clinical studies. Following administration of either 0.15 or 0.20 mg/kg rasburicase daily for up to 5 days, plasma uric acid levels decreased within 4 hours and were maintained below 7.5 mg/dL in 98% of adult and 90% of pediatric patients for at least 7 days. There was no evidence of a dose response effect on uric acid control for doses between 0.15 and 0.20 mg/kg rasburicase. In preclinical in vivo studies, rasburicase did not affect the activity of isoenzymes CYP1A, CYP2A, CYP2B, CYP2C, CYP2E, and CYP3A, suggesting no induction or inhibition potential. Clinically relevant P450-mediated drug-drug interactions are therefore not anticipated in patients treated with the recommended Elitek dose and dosing schedule. The pharmacokinetics of rasburicase was evaluated in both pediatric and adult patients with leukemia, lymphoma or other hematological malignancies. Rasburicase exposure, as measured by AUC0–24 hr and Cmax, tended to increase with a dose range from 0.15 to 0.2 mg/kg. The mean terminal half-life was similar between pediatric and adult patients and ranged from 15.7 to 22.5 hours. The mean volume of distribution of rasburicase ranged from 110 to 127 mL/kg in pediatric patients and from 75.8 to 138 mL/kg in adult patients, respectively. Minimal accumulation of rasburicase (<1.3 fold) was observed between days 1 and 5 of dosing. In adults, age, gender, baseline liver enzymes and creatinine clearance did not impact the pharmacokinetics of rasburicase. A cross-study comparison revealed that after administration of rasburicase at 0.15 or 0.20 mg/kg, the geometric mean values of body-weight normalized clearance were approximately 40% lower in Japanese (n=20) than that in Caucasians (n=22). Carcinogenicity studies in animals to evaluate tumorigenic potential of rasburicase have not been performed. Rasburicase was not mutagenic in the Ames, unscheduled DNA synthesis, chromosome analysis, mouse lymphoma, and micronucleus tests. Rasburicase did not affect reproductive performance or fertility in male or female rats at a dose 50-fold higher (10 mg/kg) than the recommended human dose. Pregnant rabbits dosed daily with 10 to 100 times the human dose of rasburicase during the period of organogenesis (gestation day 6–19) exhibited teratogenic effects, clinical signs of maternal toxicity including weight loss and mortality, decreases in uterine weights and viable fetuses, and increased fetal resorptions, postimplantation losses and abortions. Teratogenic effects included multiple heart and great vessel malformations at all dose levels. Multiple heart and great vessel malformations were also observed in offspring of pregnant rats treated with approximately 250 times the recommended human dose of rasburicase. There are no data available regarding the level of rasburicase exposure in the offspring. Elitek was administered in three studies to 265 patients with acute leukemia or non-Hodgkin's lymphoma. These clinical studies were largely limited to pediatric patients (246 of 265). Elitek was administered as a 30-minute infusion once (n=251) or twice (n=14) daily at a dose of 0.15 or 0.2 mg/kg/dose (total daily dose 0.2–0.4 mg/kg/day). Elitek was administered prior to and concurrent with anti-tumor therapy, which consisted of either systemic chemotherapy (n=196) or steroids (n=69). Study 1 was a randomized, open-label, controlled study conducted at six institutions, in which 52 pediatric patients were randomized to receive either Elitek (n=27) or allopurinol (n=25). The dose of allopurinol varied according to local institutional practice. Elitek was administered as an intravenous infusion over 30 minutes once (n=26) or twice (n=1) daily at a dose of 0.2 mg/kg/dose (total daily dose 0.2–0.4 mg/kg/day). Initiation of dosing was permitted at any time between 4 to 48 hours before the start of anti-tumor therapy and could be continued for 5 to 7 days after initiation of anti-tumor therapy. Patients were stratified at randomization on the basis of underlying malignant disease (leukemia or lymphoma) and baseline serum or plasma uric acid levels (<8 mg/dL and ≥8 mg/dL). The primary study objective was to demonstrate a greater reduction in uric acid concentration over 96 hours (AUC0–96 hr) in the Elitek group as compared to the allopurinol group. Uric acid AUC0–96 hr was defined as the area under the curve for plasma uric acid levels (mg hr/dL), measured from the last value prior to the first dose of Elitek until 96 hours after that first dose. Plasma uric acid levels were used for all uric acid AUC0–96 hr calculations [see Warnings and Precautions (5.4)]. The demographics of the two study arms (Elitek vs. allopurinol) were as follows: age <13 years (82% vs 76%), males (59% vs 72%), Caucasian (59% vs 72%), ECOG performance status 0 (89% vs 84%), and leukemia (74% vs 76%). The median interval, in hours, between initiation of Elitek and of anti-tumor treatment was 20 hours, with a range of 70 hours before to 10 hours after the initiation of anti-tumor treatment (n=24, data not reported for 3 patients). The uric acid AUC0–96 hr was significantly lower in the Elitek group (128 ± s.e. 14 mg hr/dL) as compared to the allopurinol group (328 ± s.e. 26 mg hr/dL). All but one patient in the Elitek arm had reduction and maintenance of uric acid levels to within or below the normal range during the treatment. The incidence of renal dysfunction was similar in the two study arms; one patient in the allopurinol arm developed acute renal failure. Study 2 was a multi-institutional, single-arm study conducted in 89 pediatric and 18 adult patients with hematologic malignancies. Patients received Elitek at a dose of 0.15 mg/kg/day. The primary efficacy objective was determination of the proportion of patients with maintained plasma uric acid concentration at 48 hours where maintenance of uric acid concentration was defined as: 1) achievement of uric acid concentration ≤6.5 mg/dL (patients <13 years) or ≤7.5 mg/dL (patients ≥13 years) within a designated time point (48 hours) from initiation of Elitek and maintained until 24 hours after the last administration of study drug; and 2) control of uric acid level without the need for allopurinol or other agents. The study population demographics were: age <13 years (76%), males (61%), Caucasian (91%), ECOG performance status=0 (92%), and leukemia (89%). The proportion of patients with maintenance of uric acid concentration at 48 hours in Study 2 was 99% (106/107). Study 3 was a multi-institutional, single-arm study conducted in 130 pediatric patients and 1 adult patient with hematologic malignancies. Patients received Elitek at either a dose of 0.15 mg/kg/day (n=12) or 0.2 mg/kg/day (n=119). The primary efficacy objective was determination of the proportion of patients with maintained plasma uric acid concentration at 48 hours as defined for Study 2 above. The study population demographics were: age <13 years (76%), Caucasian (83%), males (67%), ECOG=0 (67%), and leukemia (88%). The proportion of patients with maintenance of uric acid concentration at 48 hours in Study 3 was 92% in the 0.15 mg/kg group (n=12) and 95% in the 0.2 mg/kg group (n=119). Data from the 3 studies (n=265) were pooled and analyzed according to the plasma uric acid levels over time. The pre-treatment plasma uric acid concentration was ≥8 mg/dL in 61 patients and was <8 mg/dL in 200 patients. The median uric acid concentration at baseline, at 4 hours following the first dose of Elitek, and the per-patient fall in plasma uric acid concentration from baseline to 4 hours were calculated in those patients with both pre-treatment and 4-hour post-treatment values. Among patients with pre-treatment uric acid ≥8 mg/dL (baseline median 10.6 mg/dL [range 8.1–36.4]), the median per-patient change in plasma uric acid concentration by 4 hours after the first dose was a decrease of 9.1 mg/dL (0.3–19.3 mg/dL). Among the patients with a pre-treatment plasma uric acid level <8 mg/dL (baseline median 4.6 mg/dL [range 0.2–7.9 mg/dL]), the median per-patient change in plasma uric acid concentration by 4 hours after the first dose was a decrease of 4.1 mg/dL (0.1–7.6 mg/dL). Figure 1 is a box and whisker plot of plasma uric acid levels inclusive of 261 of the 265 Elitek treated patients from Studies 1, 2, and 3. Of the 261 evaluable patients, plasma uric acid concentration was maintained [see Study 2 for the definition of uric acid concentration maintenance], by 4 hours for 92% of patients (240/261), by 24 hours for 93% of patients (245/261), by 48 hours for 97% of patients (254/261), by 72 hours for 99% of patients (260/261), and by 96 hours for 100% of patients (261/261). Of the subset of 61 patients whose plasma uric acid level was elevated at baseline (≥8 mg/dL), plasma uric acid concentration was maintained by 4 hours for 72% of patients (44/61), by 24 hours for 80% of patients (49/61), by 48 hours for 92% of patients (56/61), by 72 hours for 98% of patients (60/61), and by 96 hours for 100% (61/61). A total of 342 adults with either leukemia, lymphoma, or other hematologic malignancy received Elitek in five studies (one randomized study, Study 4, and four uncontrolled studies). Across the five studies, Elitek was administered at a dose of 0.15 mg/kg/day (n=38) or 0.2 mg/kg/day (n=304). Study 4 was a randomized (1:1:1), multi-center, open-label study conducted in patients with leukemia, lymphoma, and solid tumor malignancies at risk for hyperuricemia and TLS. A total of 275 adult patients received at least one dose of study drug. The median age was 56 years, 62% were males, 80% were Caucasian, 66% had leukemia, 29% had lymphoma; 18% were hyperuricemic (uric acid ≥7.5 mg/dL) at study entry. Patients in Arm A received Elitek for 5 days (n=92). 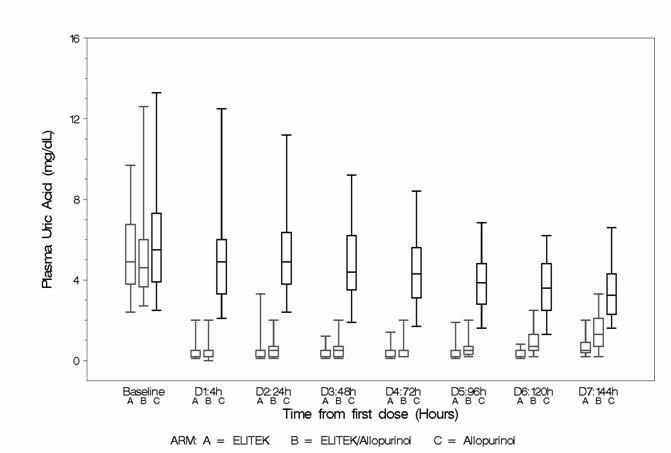 Patients in Arm B received Elitek from day 1 through day 3 followed by oral allopurinol from day 3 through day 5 (overlap on day 3: Elitek and allopurinol administered approximately 12 hours apart) (n=92). Patients in Arm C received oral allopurinol for 5 days (n=91). 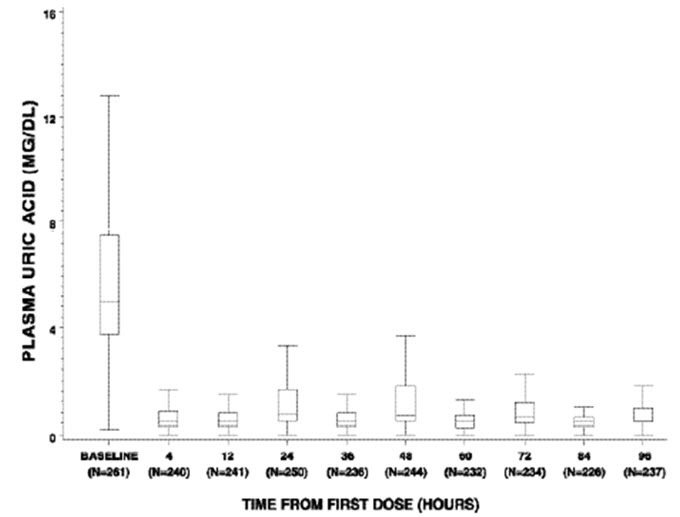 Elitek was administered at the dose of 0.2 mg/kg/day as a 30-minute infusion once daily. Allopurinol was administered orally at the dose of 300 mg once a day. Patients were eligible for the study if they were either at high risk or potential risk for TLS. The major endpoint of this study was the uric acid response rate defined as the proportion of patients with plasma uric acid levels ≤7.5 mg/dL from day 3 to day 7, after initiation of antihyperuricemic treatment. Table 2 presents the response rates in the three treatment arms. The response rate in arm A was significantly greater than in arm C (p=0.0009). The response rate was higher for arm B compared to arm C; this difference was not statistically significant. There were no patients with documented failure to control uric acid in arms A or B. In arm C, 34% of patients did not have a uric acid response; 11% due to failure to control uric acid and 4.4% due to the need for extended antihyperuricemic treatment. Box and whisker plots of uric acid over time for the patient population (Figure 2) show that in the two arms containing Elitek, uric acid levels were ≤2 mg/dL in 96% of patients at 4 hours of the day 1 dose. Clinical TLS was defined by changes in at least two or more laboratory parameters for hyperuricemia, hyperkalemia, hyperphosphatemia and hypocalcemia and at least one of the following events occurring within 7 days of treatment: renal failure/injury, need for renal dialysis, and/or serum creatinine increase >1.5 ULN, arrhythmia or seizure. Clinical TLS occurred in 3% of Elitek-treated patients, 3% of Elitek/allopurinol-treated patients, and 4% of allopurinol-treated patients. NDC 0024-5150-10: One carton contains 3 single-dose vials each containing 1.5 mg of rasburicase and 3 ampules each containing 1 mL diluent. NDC 0024-5151-75: One carton contains 1 single-dose vial containing 7.5 mg of rasburicase and 1 ampule containing 5 mL diluent. The lyophilized drug product and the diluent for reconstitution should be stored at 2–8°C (36–46°F). Do not freeze. Protect from light. Instruct patients to notify their physician immediately if any of the following occur: allergic reaction, bronchospasm, chest pain or tightness, dyspnea, hypoxia, hypotension, shock or urticaria [see Boxed Warning, Warnings and Precautions (5.1)].